For over a century, the BSA has helped build the future leaders of this country by combining educational activities and lifelong values with fun. The Boy Scouts of America believes — and, through over a century of experience, knows — that helping youth is a key to building a more conscientious, responsible, and productive society. Our Troup is governed by the Greater Alabama Council, Boy Scouts of America. Boy Scout Troup 91 is the Boy Scout Troup sponsored by our Parish. It is open to all boys age 11 to 18. We meet every Monday evening from 7:00 to 8:30 in the Church Cafeteria. We do lots of exciting things! We go canoeing, camping, hiking & even snow skiing! We go to Summer Camp and Camporees every year. We learn First Aid, Map & Compass skills, how to use a knife and axe and of course how to tie knots! If you are interested, stop by at a Scout meeting to check us out or contact Barry Densmore, 256-318-2095 or densmorebj@gmail.com for more information. Please consider supporting our troup with an online donation. Contributing to the Boy Scouts of America creates opportunities for youth to gain memorable experiences and become instilled with values, principles, and skills that will help them develop into the future leaders of our nation. Boy Scouts of America is a nonprofit 501(c)(3) organization. Your donations are fully tax-deductible to the extent allowable by law. Yes! I want to support my local Boy Scout Troup 7091 Now! Headed out to Summer Camp 2016! Cub Scout Pack 91 is the Cub Scout pack sponsored by our Parish. Pack 91 is for boys grades 1st -5th who wish to join us on the Scouting journey. 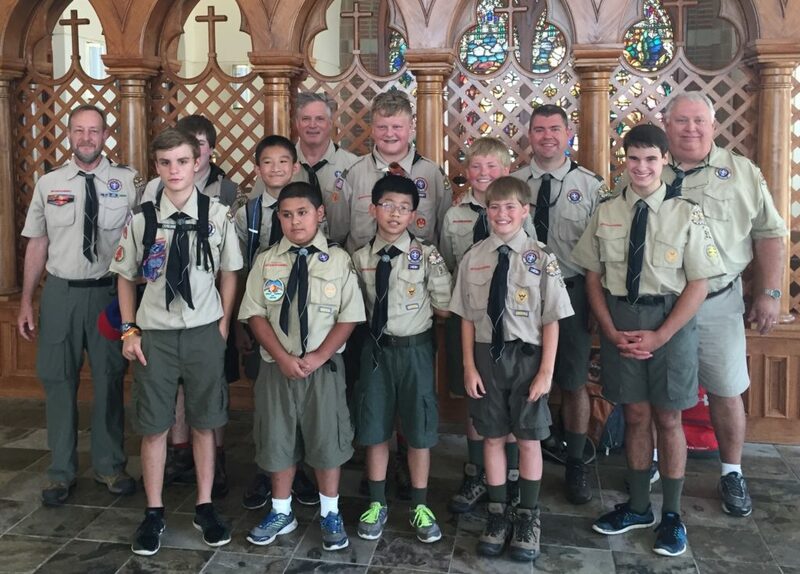 Although the Pack is separate from the Parish, the strong moral code of our Charter Organization blends well with the teachings of morality and kindness of the Boy Scouts. We accept new members at any time and welcome curious parents and prospective Scouts to come visit with us at a Pack meeting to see if Scouting is a good fit for their lives. We camp, play games, learn new things and become good citizens as we strive to help our future leaders grow.